In today’s world, we have the rare and precious teachings and practices of mindfulness that invite us to slow down, stop, and “take a backward step.” Mindfulness is not about doing something strange, exotic, or anti-social. It is about letting ourselves open to the depths and richness of the present moment, this very moment, no other than being right here, right now: a miracle in this time when so many are rushing here and there, at great cost to themselves and to the world that all of us share. 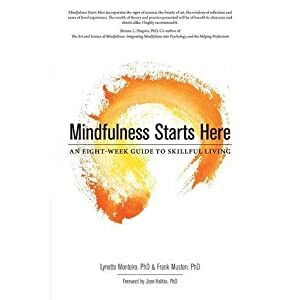 This wonderful book, written by Lynette Monteiro and Frank Musten, is an instruction manual for waking up to the present moment. It introduces the reader to the art and practice of living mindfully, of wise mindfulness, and of an ethical field that undergirds the life well and carefully lived. No matter how blessed our life might be or have been, there are always moments when we are touched by stress and suffering. Illnesses, loss, errors in judgment, just plain reality intrude upon us. It is exactly here where mindfulness can take the pain and suffering of the less ideal experiences of being human, and can turn those experiences into teachings. And yes, these teachings can be rare and treasured opportunities. This is what we call “turning into the skid” and mindfulness makes it possible for us to turn into the skid and land safely in the next moment. The chapters of this book take us through a series of exercises that open the vast field of mindfulness. We begin with our very human body, a veritable treasure house inviting us into awareness. We move then through the fields of our emotions, then sensations. We open ourselves to our thought streams then, and the reminder that “thoughts make the thinker.” All these wonderful practices introduced to us can lead us from ill-being to well-being, if we engage them faithfully and whole-heartedly. Lynette and Frank give the reader and practitioner so many tools for not only survival but human flourishing. Out of this flourishing comes a deep resilience to the challenges we face in our life. It outlines pathways that can bring out the best in us and in the world. I encourage you to follow the sequence they have crafted from their years of experience as teachers. Do the exercises, the practices. This wonderful manual is a step by step method leading the individual through exercises and wisdom that offer so much to us. Finally, the skill of our authors, who are therapists as well as deep practitioners, is something really important. We are reading the work of people who have worked in very complex and difficult situations. They know their stuff, and we are the beneficiaries of their extraordinary experience.